Edgar Degas’ unusual angles and attention to detail is remarkable, and is a great lesson in concentration. 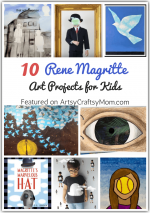 Let’s learn more about this artist with some enchanting Edgar Degas art projects for kids! Most artists’ work have certain frame-like quality to them. There’s the background, and then there’s the subject matter in the foreground, each one receiving a treatment that matches the artist’s style. However, French artist Edgar Degas is an exception to this. With friends like Mary Cassatt and Edouard Manet, Edgar Degas is considered one of the founders of Impressionism but like most artists, he rejected labels. To understand more about him, take a look at his painting, “The Bellelli Family”, based on his aunt Laura and her family. At first glance, this appears to be just a regular family portrait. But you’re also getting the feeling that something is off in this picture. Look a little closely and you’ll see why. This isn’t exactly your average happy family. The father seems like he was interrupted in the middle of work, and his position indicates that he can’t wait to get back to it. The mother is in mourning, and her expression and stance give the impression that all is not well between husband and wife. The children’s positions are poles apart, with one sitting rather playfully and the other looking uptight and sullen. There are many other details too – in fact, there is an entire story in this painting! And that is the hallmark of Degas’ work – his attention to detail. His paintings often capture a particular angle of a scene, and the lines between background and subject are blurred. He was also a fan of capturing subjects in motion, which probably explains why so much of his work is based on dancers. Degas painted a lot of contemporary life, like people sitting in a cafe, a woman combing her hair or a laundress ironing clothes. I’m sure that by now, you’re rather intrigued about this artist who despite failing eyesight, paid so much attention to detail. 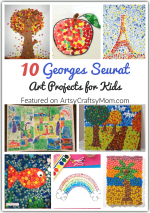 So let’s learn more about him and his work with these enchanting Edgar Degas art projects for kids! Degas’ art was all about movement, and we know that’s why he enjoyed painting dancers. So it’s only fitting that we begin our list or Degas art projects with moving ballerinas! Check out this project from Kim Weissenborn that uses brads to help the dancers move. A great project for secondary school goers and preteens. When you look at Degas’ Dancers, you see that while he puts a lot of detailing in the picture, the focus is on what is happening, rather than what is there. You get the feeling that the person in the painting is just about to move her hand or jump into the air – that’s the magic of Degas! Dymphna’s Song helps kids get the hang of this with a lesson on how to draw a ballerina. While some of Degas’ work features individuals, many show groups, especially when it comes to dance. Dancers are shown in various positions – at the bar, stretching, adjusting their shoes and more. Check out this project from Arte Con Tus Manitas that features a pair of dancers doing different things. I have to say that the cupcake liners make cute tutus! 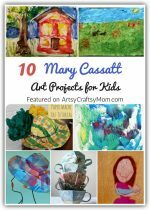 The Crafty Crow has an easy project based on the book ‘Chasing Degas’. It includes everything: getting the ballerina poses right, drawing in the facial expressions and dressing them up in pretty clothes. Love the colors used here! This book tells the story of Marie, a little girl who loves ballet but can’t afford lessons. She then decides to earn some money by modeling for famous artist Edgar Degas, after which her life changes completely! This book introduces kids to the artist’s iconic work, The Little Dancer with beautiful illustrations that’ll make the kids want to learn more. Edgar Degas wasn’t just a painter, he was also a sculptor, and even there his favorite subject was dance. Let the kids get into sculpting mode too, with this ballerina sculpture project from Snuggle Bug University. Use air drying clay, which you can get at your craft shop. Don’t forget to dress them up! We know that Edgar Degas liked to ‘crop out’ parts of a scene, which gives his work that unique touch. Renee Lannan has gone a step further and cropped a scene from Degas’ painting! This project focuses on a dancer from ‘The Ballet Rehearsal’ and is done on muslin cloth. 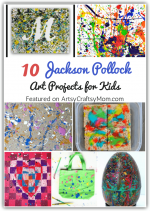 It involves multiple steps but is a good project for older kids who’d like to try out different techniques in art. If your kids are too young for the clay sculpture, they can try out these easy Popsicle stick ballerinas from Glued to My Crafts. And these ballerinas can move too! Twist their little pipe cleaner arms up and around to get many ballet poses. And when you’re done, just prop them up on your desk for some pretty decor! This coloring page based on Degas’ ‘The Dance Studio’ should be interesting to work on, considering the muted colors in the original. Little kids can fill in whatever they feel like, but let the older kids have more of a challenge by trying to replicate the strokes in the original. Here is a sculpture that can be incredibly satisfying! Mrs. Knight’s Smartest Artists shows us how something a simple as scrunching foil can turn into art! 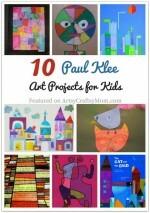 This is a great project for kids of all ages, and it helps to have a model to look at – if it’s 3D, then all the better! Don’t forget the shadow! 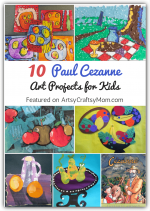 There’s a lot to learn with these Edgar Degas art projects for kids. Besides the attention to detail, Degas’ work has a dynamic quality about it, almost like you know it’s going to move! While Degas captured live motion into art, American ballerina Misty Copeland used those poses in real life for a photo shoot a couple of years ago. A painter born in the 1800s inspiring a live art show in the 21st century – now that’s the magic of art! I’d never heard of your site before, but wow–you have gathered so many good ideas into one place! Lovely!